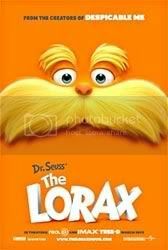 The Lorax is based on the Dr. Seuss story of the same name, but with quite a lot of expansion to the original story. A boy named Ted (voiced by Zac Efron) seeks out the Once-ler so he can find out about trees – real trees – and perhaps find a real seed with which to impress Audrey (Taylor Swift), the girl he likes. When Ted finds the Once-ler, he learns the sad story of how the Once-ler caused the destruction of the trees (and the rest of nature) all around. The original story was very much focussed on the Once-ler’s retelling of how he found the truffula trees to be perfect for his thneed and how his greed resulted in the decimation and pollution of the forest. The Lorax – a sort of tree-guardian, forest spirit creature – appears to attempt to stop him from cutting down all the trees and destroying the forest. That story was not, perhaps, the easiest of Dr. Seuss stories to adapt to screen. The nameless main narrator is never seen except for his arms – throughout the entire book. The Lorax itself doesn’t exactly do much in comparison to the narrator, and there is no substantial information about the boy to whom the Once-ler tells this story. By keeping the Once-ler faceless and mysterious (and also pretty much body-less except for the arms), as the reader you’re forced to focus on and identify or empathise more with the Lorax and the creatures that inhabit the truffula forest. In a way it lends itself better to simple book format. It would require some awkward framing and all sorts of script and storyboard gymnastics to do the same thing – to keep the Once-ler mysterious – in motion. In general the designs were quite true to the Dr. Seuss drawings. It was only the human characters that felt a little more contemporary and lacking in the Seussian quirkiness. The colours were nice and bright overall though. I have to say that I didn’t like the songs. However, in all fairness, I think they were composed to appeal to a younger, modern audience (argh, I’m old) that enjoys pop music better. I like my in-movie songs in a more Rodgers & Hammerstein or Alan Menken-esque form. They weren’t bad songs, but they just weren’t the sort I like. I thought the contemporary feel of the music didn’t match Dr. Seuss. Maybe if I hadn’t read the original story and if I hadn’t liked it for what it was (despite the fact that it was a super-obvious morality tale about the environment and how mankind is affecting it) and if I really liked contemporary (English) pop music, I would have liked The Lorax better. It’s cute, and is a decent adaptation, but I can’t say I like it all that much. BlueSky did so much better with Horton Hears a Who than Illumination did with this one (though that story was much simpler to adapt than The Lorax).